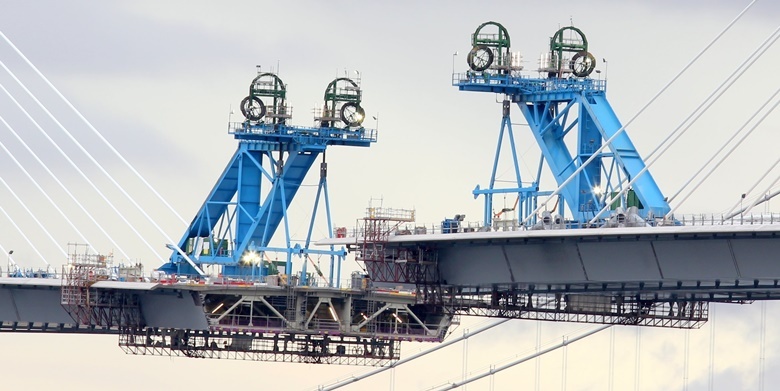 The UK’s largest bridge project battles fierce weather conditions. 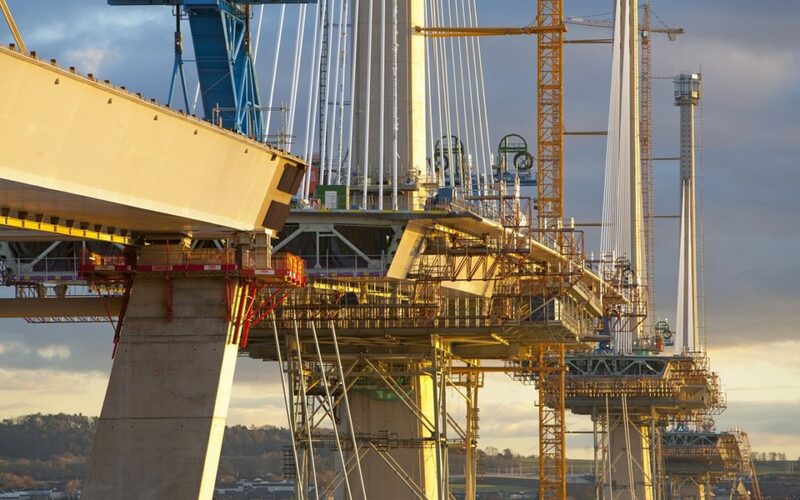 Observant commuters on Scotland’s Forth Road Bridge may this month notice a third deck closure taking place on the main balanced-cantilever spans of the new Queensferry Crossing just upriver. And, as low winter sunshine highlights more than 200 glistening white cable supports for this elegant cable-stayed bridge, the public could be forgiven for thinking the massive structure is approaching completion. Formed initially of three massive balanced cantilevers and approach viaducts, the 2.7km crossing now needs only two final deck closures. Opening of the £790M bridge, with its extensive road network either side, is expected mid May next year. According to the New Civil Engineer, the last of 110 composite steel and concrete deck segments will soon be lifted from barges in the estuary, and the first of the site’s three 235m high tower cranes is being dismantled. Technically, construction work – involving some of the most innovative cutting-edge bridge design and erection yet achieved anywhere – is proving virtually flawless. But there remains an uncontrollable gremlin in the works. The seemingly never ending, extreme, unpredictable mid-estuary weather conditions are continuing to affect progress. Ongoing high winds, rain and now low temperatures are all aggravating weather-sensitive critical path construction operations. 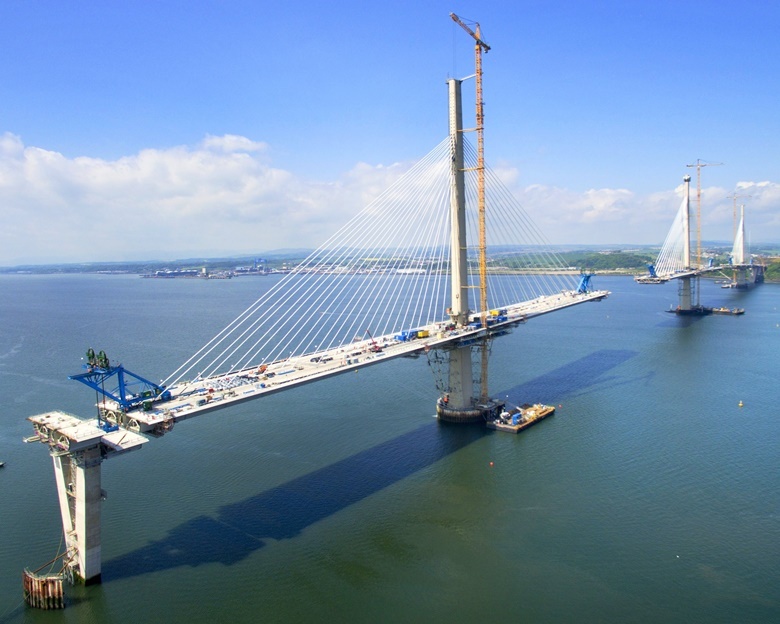 Near double the expected weather-induced downtime throughout the last two years means the long held aspiration of contractor Forth Crossing Bridge Constructors (FCBC) completing the crossing early this December will not be achieved. Bridge opening is currently estimated at mid May next year; a target still however a month ahead of the contracted completion date. Only three of the original six blue deck-erection cranes remain in position. Martin’s site-based opposite number at client Transport Scotland (TS) backs totally the contractor’s statement. The bridge forms the major part of the £790M Forth Replacement Crossing contract which includes extensive motorway-standard approach roads both sides. A deck segment, only a third the size of a normal section, is erected for final cantilever closures. As its 2.7km deck nears structural completion, both engineers point to follow-on critical path extensive finishes about to start – waterproofing, surfacing and painting – all sequential and all now with winter programmes at the mercy of not just wind but rain and low temperatures. Eventually 3m high louvred wind-shielding will be placed the full length of the bridge deck. And, as Martin points out, its function and sheer scale point to possible difficulties erecting it during winter months. 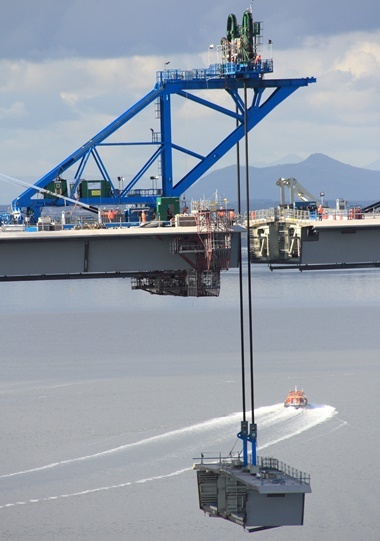 Virtually all the 750t deck segments, fabricated in China and topped with surface concrete in casting bays at nearby Rosyth docks, have now been towed 3km downriver to the bridge site. Anchored in the fast flowing estuary to within the required 200mm positioning tolerance, all have been successfully lifted into the deck by cantilever-end traveller cranes. Despite 14m/s wind restraints during the four hour lifts, experience gained over the 14 month programme has resulted in the planned segment erection schedule often being bettered. This has allowed FCBC to recover some time lost when weather conditions prevented lifts taking place. Lifting round the clock at all states of the 6m tide, developing the ability to lock-off a suspended box at any stage, plus always having loaded barges on standby, regularly increased weekly totals to four and once five. Cable erection crews must operate from open baskets raised to tower tops. The follow-on programme of welding, bolting and pouring a deck-level concrete stitch – all to secure the new section to its cantilever end – has also benefited from site-gained experience. A redesigned access gantry – suspended from deck soffits, environment controlled mobile tenting over key welded areas that needed primer paint, plus an ongoing logistics exercise organising the 150 strong multi-trade workforce per tower all seeking the same space at the same time, has shaved at least a day off this critical path cycle. Kiely attributes much of the positioning success to extensive trial erection of the entire deck years ago at the Shanghai fabrication yard. Supervised by a dozen-strong engineering team from contractor, client and designer Forth Crossing Design Joint Venture – a grouping of Ramboll, Sweco and Leonhardt, Andra und Partner – up to 11 deck sections at a time were fully preassembled. Scores of locating marks, with their required measurements, were established for later use by site engineers. This has considerably eased the erection team’s time-consuming task of achieving correct loading, stress and orientation of deck sections – every one slightly different. “It is noticeable that in the few special areas not trial assembled we have had to do a bit more tweaking to get it right,” Kiely recalls. Hundreds of metres above deck, work is at the mercy of extreme weather conditions. Not such smooth sailing is conceded for the linked massive critical path operation of cable stay erection and stressing. 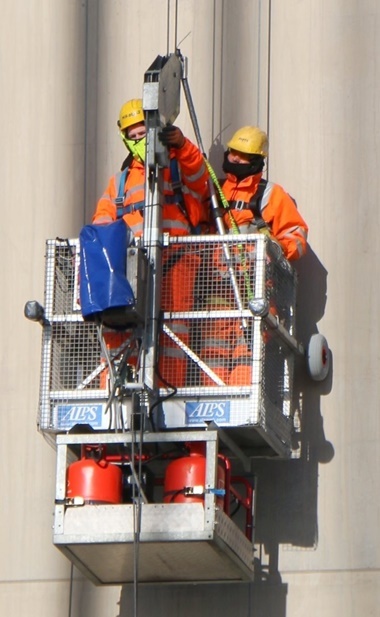 Cruelly demanding at times some of the most stringent wind restraints of any operation – just 11m/s while cable strand is secured at tower tops – the roughly 250 cables so far positioned have notched up the site’s most weather-induced downtime. And a dozen of the maximum 420m long cables have still to be threaded into the highest tower-top anchor blocks. The tower-top cable positioning and strand threading demands up to six men in three small open baskets hoisting themselves on wire supports up the outside face of each tower – over 200m tall. It is this totally exposed operation that, not surprisingly, demands such rigorous wind restraints. Despite near continuous meteorological office weather reports, plus some 60 wireless and hand held anemometers spread along the site, the basket crews have to individually take wind speed readings as they attempt to climb the towers. New Civil Engineer watched while one basket operation was repeatedly on/off, leaving cable crews able only to watch, as localised wind gusts buffeting around the towers ruled totally over the day’s progress. Equally severe are the wind speeds controlling key operations during the four main deck closures. 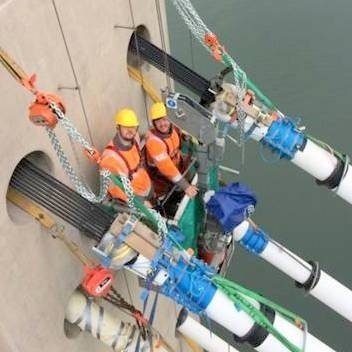 With the third underway this month in the northern main span, each extremely complex two week multi-phase connection demands repeated cable load adjustment and massive inter box temporary stressing to achieve the essential zero positioning accuracy both vertically and horizontally. Raising, to just 50mm accuracy, the 6.1m long closure deck section – a third the length of a normal box – into the narrow gap between northern and central tower balanced cantilevers, demands the deck cantilevered from the northern tower being temporarily ‘pushed’ 300mm landward by a 400t jacking operation at deck level. The cable-stayed bridge deck is formed primarily of three balanced cantilevers. Normally immediate connection between this shorter deck section and the northern cantilever would follow. But for this closure the standard procedure is replaced by a special locking arrangement. To allow final alignment adjustment, a more flexible connection is used involving 38 Macalloy bars threaded horizontally between the two deck sections. With segment positioning finalised, the 75mm diameter bars are temporarily loaded to 9000t and, after follow-on welding between deck sections, are then immediately de-stressed. Vertical differences between the two cantilevers can initially reach 4m before final balancing. 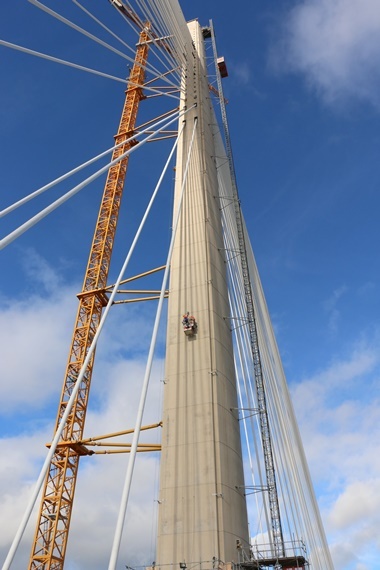 Several days of repeated stress tweaking to already erected cable stays in up to seven deck sections around the closure area is needed to ensure the spans can mate exactly. This will soon be one of most iconic bridge vistas anywhere, with three such innovative river crossings elegantly illustrating engineering developments over the last three centuries. To stabilise this final levelling, a large temporary works steel frame, containing small adjustment jacks, is laid across the remaining gap between the cantilevers. Movement of the frame must at this stage be zero, so work must be suspended if wind speeds exceed 6m/s. Releasing the jacks holding back the northern tower deck reduces the final closure gap to just 5mm.The join is completed by bolting, welding and pouring the normal deck level concrete stitch. Initially there can be up to 4m vertical deflection between adjacent deck cantilevers. The total 10 day closure operation involves cutting-edge bridge technology. With the central tower’s 644m balanced cantilever claiming a world record length, each closure’s several hundred measurements are overseen by complex computer software monitoring real time loadings, stresses, orientation and global positioning surveys. The fourth and final main closure – linking the far southern end of the bridge’s four spans to its approach viaduct – is now planned for early next year. This would originally have triggered a full scale attack on finishing operations across the total bridge; waterproofing, painting, blacktop, weather-shield erection and threading a multitude of services through deck sections. But FCBC construction director Alan Platt, conscious of these now wintertime operations mostly being sequential, is keen to get started early. 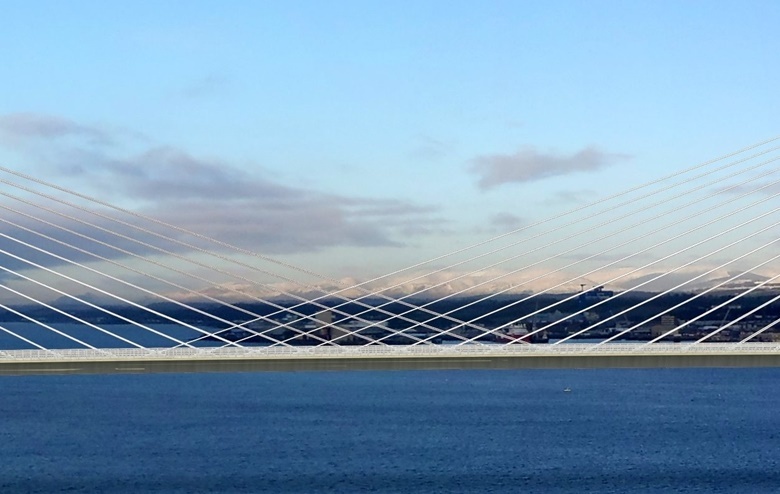 Ten overlapping cable stays will strengthen each of the two central river spans. Centre-stage of the bridge’s aesthetic and structural elegance will be the highly visible crossover stay cables covering a 160m length of deck, mid point along the two main river spans. This innovative solution to the structural challenge of stabilising the central mid-estuary tower, will add considerably to the slender cable-stayed crossing’s visual impact. Both the northern and southern towers are stabilised primarily by back-span deck cables anchored directly over strategic V-shaped piers in the two sides’ approach viaducts. These concrete piers are further strengthened, and the deck prevented from uplift, by six stressed tie- down cables fed through the hollow pier legs from deck soffits to pier base anchor points. But no such stabilisation is possible for the central tower, standing unsupported on top of the mid estuary volcanic outcrop known as Beamer Rock. 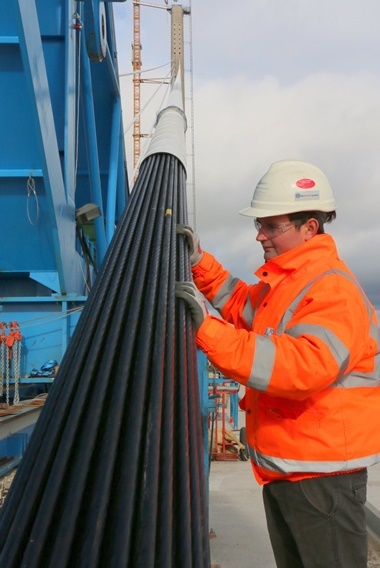 FCBC north tower section head Gerard Kiely examines the maximum 109 strand cable. Enter the clever use of 10 extra overlapping cable stays in each of the two main spans. These double to four the cable supports to each of the ten mid span deck sections both sides of the central tower. By stiffening these segments with the extra cables, the effective structural depth of the deck mid span is increased. This stiffens the entire deck sufficient for it to stabilise the central tower. Without crossover cables the deck itself would have had to be much deeper with the central tower a different shape, possibly an A-frame. Carefully timed installation of these extra cables, both before and after deck closures, is now underway. They contain about half the normal number of strands but demand a complex sequence of stress readjustment in numerous nearby main cables. They also require the very longest 420m cable lengths hoisted up to the relevant tower’s highest anchor boxes. At 210m, the central tower is the tallest of any UK bridge – with the other two towers 202m high. Not by coincidence they mirror and complement both the three massive steel-trussed cantilever support towers of the Forth Rail Bridge and the slender suspension cable towers of the Forth Road Bridge, both impressive crossings less than 1km downriver. The project boasts an unusually large 12-strong site-based design team. With up to six cantilevers being erected simultaneously, two senior design engineers are dedicated solely to the control of superstructure construction.